"When she sang, she was never the heroine. People heard their own story in her songs." WE were back in Cairo once again. We had spent more than three years in the city on the Nile (1993-1996) and were back to celebrate Millenium 2000 in this Eternal City. The entire city was engrossed in a television programme. I too would have fallen under the spell – had I had known earlier of the thirty-seven episode television series 'Kawkab Al-Sharq' depicting the life of Umm Kulthoum. She was the Egyptian diva whose phenomenal fifty year singing career entranced yesterday and today Egypt and the Arab world. During the month of Ramadan in December 1999 and January 2000, the global Arab-speaking population from the Maghreb countries in North Africa, to the Gulf states, the countries of the Fertile Crescent and the Arab Diaspora from New York to New Zealand was immersed via Arab satellite cable television in the 'Wonder of the Age'. The unique songbird in the Arab world who encompasses both a legend and a myth (the salient ingredients of an icon) was portrayed on television by Egyptian actress Sabrine and supported by a cast of two hundred and fifty. To widespread acclaim, Sabrine reached a milestone in her career. Arabic newspaper polls showed that the series was the best production ever in the Arab world. According to one effusive critic, "Sabrine successfully portrayed the omnipresent pedestal nobody will ever attain again." Early in 2000, during the prime time viewing of 'Kawkab Al-Sharq', the star of the series, Sabrine was received by the Palestinian-origin, Kuwaiti-born and American University of Cairo educated Queen Rania of Jordan. Also accorded titles as 'Star of the East', 'The Eternal Lady', 'International Chanteuse of Dreams'…Umm Kulthoum was born into a poor family in the village Tanay in Dakhalia governorate in Egypt in 1904. By the age of five, she had memorised poems and religious songs learnt from her father Shaikh Ibrahim El Beltagi. By the age of nine, Umm Kulthoum had started her singing career. Interestingly, she once said "My father was uneasy. The idea that his daughter should sing in front of men he didn't know, was difficult for him to accept, but my singing helped support the family. So he dressed me in boy's clothes, and I sang this way for several years. I realise now that he wanted to convince himself, and the audience too, that the singer was a young boy and not a young woman." In the early 1920s, she moved to Cairo in order to pursue her burgeoning singing career. Other pillars of modern Egyptian culture--Mohamed Abdel-Wahab and poet Ahmad Rami--both collaborated with Umm Kulthoum. King Farouk awarded her the Nile medal in 1946. Royalty went into exile in 1952 and politics and rulers changed hands in Egypt. Not so the 'Voice and Fame of Egypt’. President Gamal Abdel-Nasser awarded Umm Kulthoum the Order of Merit in 1960. She always maintained that she was essentially a fallahah (peasant) who shared essential values with the majority of Egyptians. Umm Kulthoum is an Egyptian icon that symbolised Arab nationalist pride and gave the nation the moral and spiritual uplift following Egypt's defeat by Israel in the 1967 Arab-Israeli war. She was the embodiment of Arab cultural renaissance. Her high-profile concerts were accorded 'state visit' status. Her Thursday concerts emptied Cairo's streets as millions turned on the radio and prepared to listen in hushed awe to the diva's incomparable voice. Her marathon concerts often stretched to six hours in length; into the early hours of the morning. A delightful anecdote that speaks of her legions of devoted followers goes like this: When one fervent soul failed to take his usual front row seat at a concert, Umm Kulthoum sent the police to find him during an intermission. It turned out that his father had just died. The fan attended the second half of the concert anyway. Umm Kulthoum passed away in 1975. Her funeral cortege rivaled or surpassed, according to many that of President Nasser who had died in 1970. Here was an outpouring of heartfelt emotion for the 'Star of the East' who epitomised Arab ethos. She was buried in the sprawling 'City of the Dead' neighbourhood of Cairo. 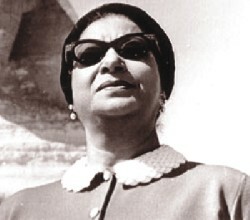 Sadly, her villa along the Nile in the aristocratic neighbourhood of Zamalek in Cairo was sold to Kuwaiti real estate developers who built a towering apartment block on the site and went on to name it Umm Kulthoum Tower! Surely this qualifies as a blatant case of crude capitalism overcoming cultural sensitivity. Umm Kulthoum's musical repertoire included more than three hundred songs on themes ranging from love to nationalism to religion. The majority of songs were sung in colloquial Arabic and some were in classical Arabic, mostly written by renowned Arab poets. Her most popular and most beloved by her multitude of devoted fans is 'Enta Omri' (You are my Life). It was written for her in 1964. Listening to 'Enta Omri', one is once again reminded that music transcends all language and all barriers. Music that touches the heart and has the ability to move one to tears, sublime music that takes one beyond oneself. The plaintive Portuguese 'fado', the evocative voice of the Italian blind tenor Andrea Bocelli, the uplifting yearning of Abida Parveen and the stirring shehnaii music of Ustad Bismillah Khan are manifestations of a divine gift that stirs the soul. Anyone who has been part of the Arab world has been touched by Umm Kulthoum's golden voice and that includes non-Arabs. Peter Mansfield, a former British diplomat, journalist and the author of a classic book on the Middle East -- 'The Arabs' -- in his chapter on Egypt concludes: "No one in modern times symbolised the ancient and the unquenchable spirit of Egypt more than the great singer Umm Kalthoum, who threw the whole Arab world into mourning when she died in her late seventies in February 1975. Her songs were written by Egypt's finest contemporary poets and musicians; her plangent notes belong to all the ages." *Raana Haider has been both a resident and a frequent visitor to Cairo over decades. A number of her writings have appeared in the Egyptian print media. She is also the author of 'Gender and Development' published by the American University of Cairo Press, Egypt, 1996.